Reconstruction the floor around the Holy Ka'bah. The work commenced on 21st Jumad AI-Thani, 1377 H. by erecting a high wooden screen around the Holy Ka'bah except at the sites of the Black Stone, Yemeni corner and Hijir Ismail (peace be upon him). They set up the scaffolding leading to the ceiling from Hijir Ismail (peace be upon him). The wood, mortar and all equipment for the repair of the Holy Ka'bah were available before the work started. In the forenoon of Friday 18th Rajah, the Crown Prince, Faisal Bin Abdul Aziz arrived on behalf of his brother, King Saud. He climbed to the roof of the Holy Ka'bah accompanied by some guests and officials, and demolished a small portion of the roof, thus announcing the commencement of the work. The upper ceiling was totally removed and lintels were set up on the four walls and the wood of the ceiling was put on them from east to west, and was firmly fixed with the best mortar. Two wooden support beams were put on top, one was on the eastern wall and the other on the western wall. Under these wooden beams, a girder was put with its edges on the northern and southern walls to support the upper ceiling. Another girder was laid to support the lower ceiling. Wooden beams were also laid on the ceiling. A short wall eighty centimetres high was built. This is called the cornice. 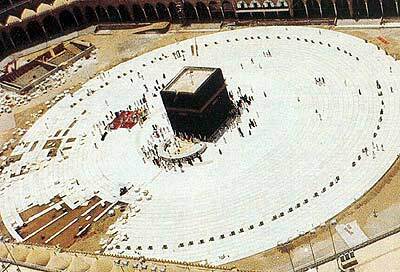 Four strong iron bars were fixed on the four walls to hang the kiswah on, instead of the previous wooden beams. The wood of the ceiling was painted with silicon. A layer of stones smeared with wax, a layer of mixed local mortar and a layer of AI-A'qul red bricks from Madinah were laid. This was covered with the previous white marble after cleaning it. The slope of the waterspout that pours into Hijir Ismail (peace be upon him) was taken into consideration. Melted lead was then cast in between the edges of the marble to strengthen them and prevent the leakage of rain water. The marble of the cornice was laid vertically on the four sides at the height of twenty-five centimetres. The opening of the stairs at the top of the roof was renovated and its cover was replaced by a new one coated with a beautiful, strong metal. Useful pieces of the old wood were utilized in addition to the new ones. The lower ceiling was renovated by replacing the broken wood that was laid on the three pillars extending from the east to the west. Only the middle pillar was completely replaced. Slight renovations were made by plastering the interior wall of the Holy Ka'bah, and the marble floor and the walls. Two large boxes, 150 centimetres long and 80 centimetres high, were made to store the lanterns and the inner curtains of the Holy Ka'bah. one fixed by Al-Sultan Abdul Majeed Khan in 1273 H. It was made of pure silver coated with gold. It was so strong that it remained as it was, and therefore it was put in its original place after repairing its wooden base and re-hammering the nails that prevent the pigeons and birds from standing on it. The inner stairs of the Holy Ka'bah, the threshold and the wall of the door buttress were renovated. The inner stairs of the Holy Ka'bah were mended without any significant changes. The three pillars supporting the ceiling made by Abdullah Ibn AI-Zubair were slightly repaired. They were still in good condition in spite of a lapse of more than thirteen hundred years. These pillars had decorated capitals and square, decorated bases. The exposed part of each pillar was seven metres long, with a diameter of about forty-four centimetres each. On the second of Sha'ban, 1377 H., it was officially announced that the renovation of the ceiling of the Holy Ka'bah was completed, together with some minor repairs.